EXHIBITION PERIOD: FEBRUARY 25. – MARCH 25. 2017. 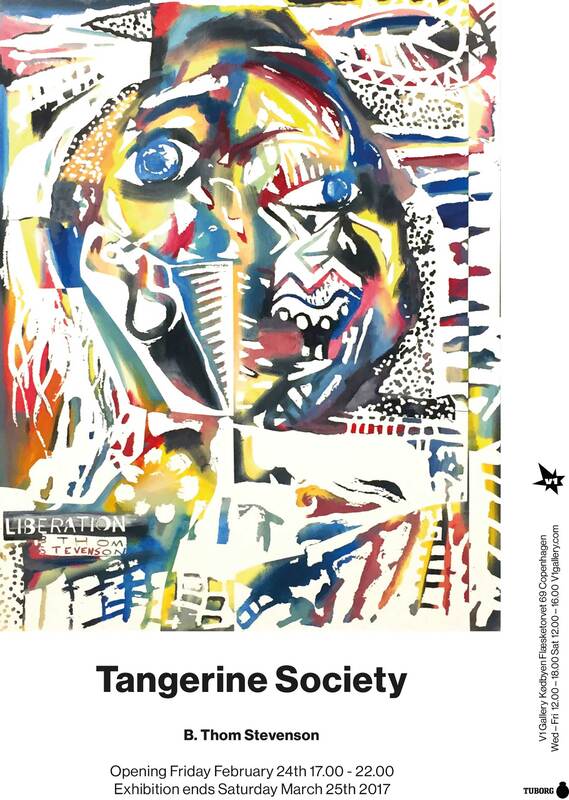 V1 Gallery is pleased to present Tangerine Society, our first solo exhibition with B. Thom Stevenson. Conflict is natural in Stevenson’s work. Each painting deals with basic conflicts such as humankind and religion, civilization and nature, society and the individual, and probably the most ancient of them all (wo)man contra self. American and Italian cult horror movies, vintage quilt templates, Celtic stone carvings, literature and politics. B. Thom Stevenson is a multifaceted artist that explores the gaps between cultures by boiling down their artefacts in order to juxtapose them in visually impactful dialogues. Pairing both original and sourced materials to form a unique vocabulary, B. Thom explores the use of language as imagery and pictures as communication tools.